Shinobi is a port of the arcade classic which was released alongside many other versions for European home computers. Unlike the PC Engine port this Amstrad CPC 464 version includes almost every stage from the arcade original. Even more impressive is that it features the first person bonus stage that wasn't available on the Japanese console! The levels are shorter but they're very faithful and you'll see many familiar features such as the picture of Marilyn Monroe in the second Ken Oh stage. The scrolling is a bit jerky and the screens can sometimes take a while to move ahead. A lot of the animation has also been stripped so once you beat the bosses the 'Round Clear' message will pop up without seeing them explode or fall to the ground. The bosses aren't too tough apart from the Mandara statues as the time limit is way too short. One of my main criticisms of the game is that you can't jump directly from a standing position; instead, you always take a step forward before jumping meaning you'll fall off ledges unless you factor this in. As a result it's difficult to make quick second reactions, especially in the Lobster stages which are full of tough enemies and tricky platforming. The most disappointing thing about this port is that the final boss doesn't actually appear - imagine working your way through the game, learning attack patterns in repeated playthroughs and finally reaching the end of the Masked Ninja stages only to be greeted with a congratulations screen without seeing the main protagonist! This is a massive oversight whether it was through lack of time or memory restrictions and it leaves an emptiness to the whole experience. There's no music or SFX in the 64K version but this is pretty standard due to memory limitations. The graphics are okay but tend to look a bit washed out and muddy. 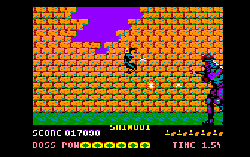 To be fair, this Amstrad CPC port plays a lot like Shinobi and is reasonably fun to play. It's easy to say that it just needed a few tweaks but in reality most of its issues are probably due to the limitations of the underpowered 464. Random trivia: The game's code features a hidden rant by developer Richard Aplin where he discusses some of the challenges he faced while working on the CPC conversions of Shinobi and Double Dragon!